William Glassner has worked independently in creating glass art since 1978. Often admired by his contemporaries, his work has focused on several different techniques over his career. 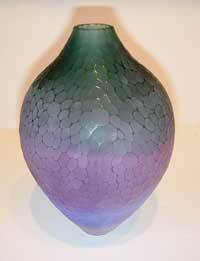 Glassner’s background in glass making began after receiving his Bachelor of Arts degree in 1969 from the University of Rochester in Rochester, NY. He has taken workshops from some of the best artists in the world including Lino Tagliapietra, Stephen Dee Edwards and Gianni Toso. 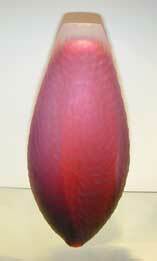 He has visited many Swedish glass studios and was an apprentice at The Rochester Folk Art Guild Studio. His work is now part of the permanent glass collection at the world renowned Corning Museum in Corning N.Y. The current work of William Glassner focuses on simple forms made with a single color transparent glass with additional molten glass textured leaves added to the outside of each piece. This is called his Leaf Applique Series. His most recent work is his Carved Series. These pieces venture in to the ancient tradition of carving away the smooth, shiny surface of the glass vessel. The surface is wheel carved by hand, using traditional “cut glass” methods, with custom made diamond impregnated wheels to achieve a randomly faceted effect of various patterned lines. The precision craftsmanship required to ”pull off” these incredible designs comes from years of experience. The pieces are acid etched and finished with an oil or chemical treatment.